When you need to replace multiple teeth — or all of them — at once, a conventional denture or partial is usually the most efficient solution. Affordable and made just for your smile, these prosthetics work to address the functional and aesthetic concerns caused by tooth loss. Our dentures and partials can be made to fit using traditional methods or affixed directly to dental implants for added stability. 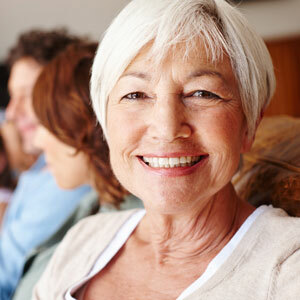 In some cases, we can retrofit existing dentures to snap over implants for a more comfortable fit. Conventional dentures rest directly on top of your gum tissue. When worn for an extended period of time, they can cause sore spots, bone loss or be uncomfortable to wear. Because they rely on suction to keep them in place, frequent rocking or shifting is common. You do not need an individual implant for each missing tooth. In fact, implants are so durable that we can attach a full-arch denture using as few as four implants total. All implant placements are completed in-house with a visiting specialist and the option for sedation or anaesthesia during your procedure. Everyone’s oral health needs are different. During your denture consultation, we will discuss how various options or combinations for treatments can give you the results you’re looking for. Whether it’s a removable denture, an implant supported bridge or a hybrid denture design, we’ll work closely side-by-side to help you select the best option for your situation. We’re open late and on Saturdays for your convenience. Contact us today to request your next appointment!